KoopaTV: Promote Fan Games, or Shut Them Down? First of all, doing nothing is the easiest path. It requires no resources on your part. However, unlike many things in life (“the harder you work, the better your results”), doing nothing about fan derivatives may actually get you the best result. It depends on what your fans want. If they just want to enjoy themselves and they're not doing anything that would actually harm your sales, then doing nothing is a great approach. It's the default one that many companies today take. You can even acknowledge the fan works as a “our franchise is so popular that it gets all of this bursting creativity” situation and list some of them in a puff piece without officially endorsing them. That's what CAPCOM did for Ace Attorney in Janet Hsu's “Ace Attorney Fans: Ace Community” blog post. What is a lot more rare are the two approaches that the reader wanted to know about: Shutting down fan games, or basically converting a fan game into an official product and promoting that? If the fan-work-turned-game is good enough, it can be considered better than what your own company produces. Converting them into official products probably takes the most amount of work, because chances are, you're not actively looking for fan products to flip. You're too busy working on actual new games from your own developer team. What has happened for Sonic Mania and Street Fighter X Mega Man is that the fan developer privately presented it to the IP-holding company and they liked it so much they decided to fund it. I've even praised CAPCOM in the past for doing that. How you can arrange for a private showcase to begin with seems really hard, and if you make a habit out of it then a lot of fans are going to waste a lot of your time. Actually throwing a guy and your marketing department to help the fan developer is also difficult if it would interfere with your existing plans. By comparison, Nintendo does not accept fan ideas and sends cease-and-desist letters to fan games famous enough to reach their attention. They view it as a possible substitute for their own products, which hurts their revenue. You could say Nintendo is paranoid, but they have proven that their franchises are never dead and they can surprise people with their official products that fan games would have the same concept of. Sending cease-and-desist letters isn't that hard. I mean, KoopaTV even got a fake one. It can have a good benefit of not associating your franchise with garbage, and maintaining an air of supremacy among your development team. “Only NINTENDO can make The Legend of Zelda games! You fans don't have the skills to do the series justice, so just enjoy what we make.” Your fans may end up resenting you, but as long as your own products are top-notch, they'll keep coming back. If not, then you'll look objectively awful. Why would you flip a fan work to an official one? Maybe you will have a big gap of time in-between games, and you want to take advantage of cheap fan labour to plug the gap so your fanbase doesn't move on. Treating them like a contractor. Fan labour is the fanbase equivalent to cheap illegal immigrant labour: It can be readily available and inexpensive if you set the conditions up, or you can set it up so it's cracked down hard. The quality might not be there, but you can spin it up as a community engagement task and your fans will side with “their own” and look past a fan-game-made-official's flaws. 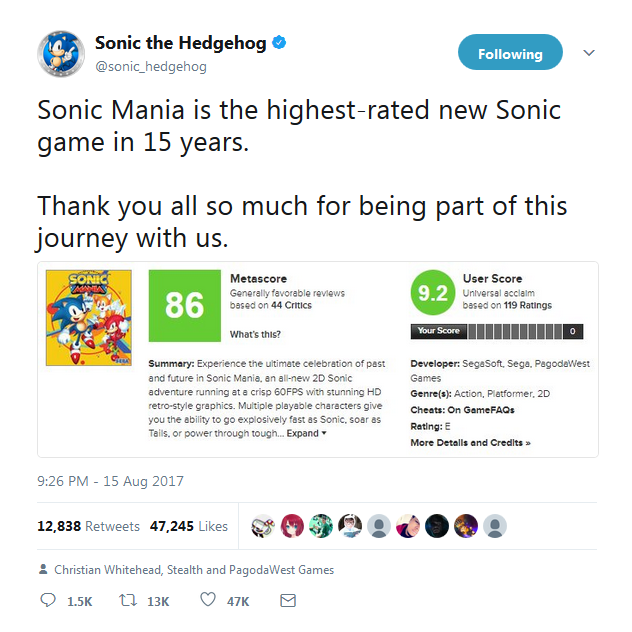 I think that's what happened with Sonic Mania, since all I hear from Rawk, who bought it, is how bad the game is, but in-the-tank Sonic the Hedgehog fans say it's game of the year. Fans just want to see “their own” succeed. You might genuinely see talent in a fan game developer and want to hire them to your company. You might even get to pay them less since they're less likely to negotiate for a better contract, instead seeing it as a total honour that you'd acknowledge them. Do you want KoopaTV's staff to write about a topic you're interested in? Head over to the Requests Page and leave a comment to let the staff know! You can even earn up to 3 points in the KoopaTV Loyalty Rewards Program per week this way. That said, Ludwig wants this requester to stop requesting articles about fan games, since this is the third one now in a year and he doesn't have anything extra to add on the topic. Ludwig wasn't even aware of Sonic Mania's origins before the requester pointed it out to him, or else he would've mentioned it in the Sonic Mania release article. Rawk wrote a review elaborating on why he dislikes Sonic Mania, and it caused a lot of trouble. You might even get to pay them less since they're less likely to negotiate for a better contract, instead seeing it as a total honour that you'd acknowledge them." Apparently, the fan translators of Mother 3 said they would not mind giving their translation for free to Nintendo. ...Yeah, but that's a bit different than being a full-time employee making whole games on a payroll. Hey, you requested this and that's all you give me? One of the best recent fan games was Another Metroid 2 remake. It featured new elements and bosses not found in the original. Unfortunately, it got taken down not too long after release due to Nintendo working on Metroid: Samus Returns for the 3ds. Yup, hence "You could say Nintendo is paranoid, but they have proven that their franchises are never dead and they can surprise people with their official products that fan games would have the same concept of." Linking to the article on that. The only fangame content Nintendo is likely to allow is anything from Super Mario Maker. Well, they let RPG Maker onto a Nintendo platform! RPG Maker Fes lets people make games, and RPG Maker Player is free and lets you play games people have made.